So I lied. Last week I said I wasn't going to write a post this week about anything I mentioned in last week's list of "Things on My Plate". We'll I've got a much larger head of steam on one of those projects than I do about a post topic that's in the works right now, so I've decided to go with what's fresh. I've written about my home-campaigns before, as well as may plans to update them to the Edge of the Empire system. The biggest hurdle (also mentioned previously) is the Jedi. I mostly solved that problem by making a Jedi Carrier and three Specializations for the career. It will likely need some tweaking and fixing when the core rulebook comes out this summer, but for the most part it looks pretty good and stable. I knew I wanted to get the whole "Lightsaber Duelist" aspect of the Jedi into the game. I've always been a big fan of the various Lightsaber Forms; heck, I did an entire seven-part series on them for the Order 66 Podcast during their final Saga Edition episodes. I didn't think the Forms deserved their own tree. I also didn't want to do shortened trees like some gamers have done. I felt the tree structure was the way to go, as during my research on the Forms for my Fragments bit on the podcast I read quite a bit how earlier forms influenced the development and practice of later forms. There were also frequent references to certain forms meshing well with others, and Jedi Masters who were combining styles. This led to my design for the initial Lightsaber Forms to be in the first few rows of the tree, and the more advanced forms higher up the tree. This seemed to work initially, but once I started trying to map out the tree it didn't feel right. I was also having trouble dividing up the forms, since trying to squeeze them all into one tree just wouldn't work. Donovan Morningfire inspired me with his suggestion during a forum discussion to group the forms along the same lines as another source of "lightsaber forms"; the Fighting Styles presented in the Dark Forces/Jedi Knight series of games. In those games, you started with the Medium or "balanced" lightsaber style and could eventually choose to take the Fast or Strong style. Looking at it this way, it was easy to fit the many Lightsaber Forms into those three categories. Well, "mostly easy" anyway. There were a couple styles that are really "best fit" or "no where else to put it. 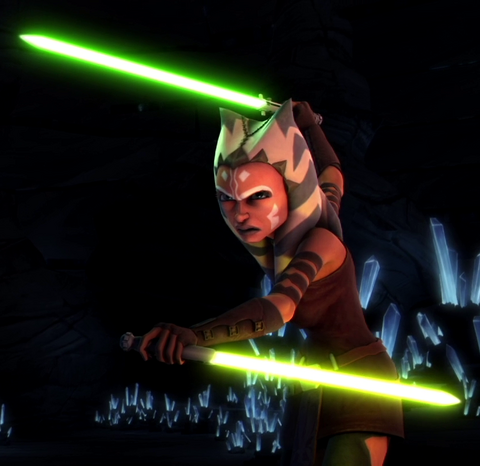 Even though there are seven forms of lightsaber combat, we really see nine distinct styles of blade-work. After careful review, and recommendation on the forum discussion, the Lightsaber forms break down as follows. In keeping with the feel of the Dark Forces games, and with the natural learning progression of lightsaber combat, it is easy to meet the per-requisites for the Balanced Style specialization. Right now you only need to have one rank in the Lightsabers skill to pick up this Universal tree. Also, many of the low-tier skills are Passive and Active talents without a Force Rating requirement. This allows characters without the Force to become somewhat skilled with lightsaber combat, or at least some of the moves that are based on physical skill rather than Force use. Very quickly, branches of the tree will be cut off by talents that require the character to have a Force Rating to take. Further progression will only be possible to those with the Force. It's somewhat amusing how I mapped out the trees. 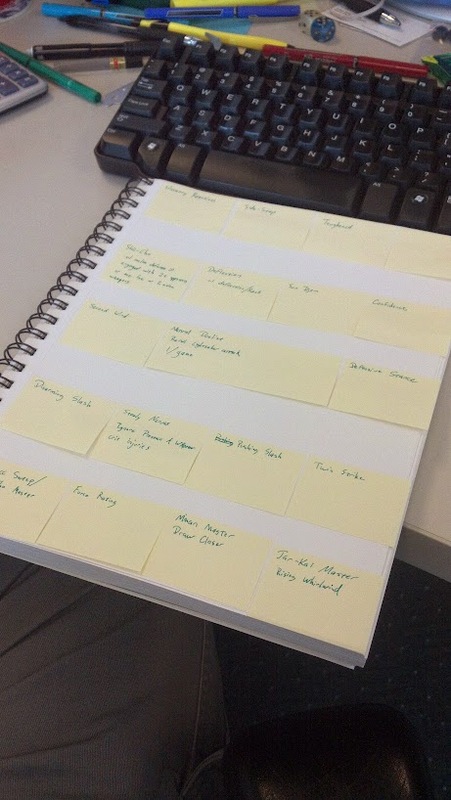 I took a notebook, a stack of mini Post-Its, and laid it out. This allowed me to shift around talents, or pull them and replace them with new talents as the tree developed. The Balanced Lightsaber Style Specialization Tree (...man, that's a long name) is home to the first form, Shii-cho, the Sixith form, Niman, and the fine art of wielding two lightsabers (or a saberstaff), Jar'kai. I also placed Sokan into this tree, as a duelist's ability to take advantage of the terrain is good for all combat styles. Actually, I put Sokan in here mostly because of the three "extras", Vaapad needed to go with Juyo and Trakata feels like it needs speed over power or balance to work effectively. It just happened to line up that Sokan fits well into Balanced. The Balanced tree represents the basics and the blending of Lightsaber combat. A Jedi to takes these forms in not only improving his lightsaber style, but also himself. It's why talents like Uncanny Reactions, Toughened, Second Wind, and Steely Nerves are found in the tree. The key to the tree lies in Side-Step, allowing the duelist to improve his defenses against ranged attacks. Many martial arts teachers say the best way to deal with a strike is to not get hit in the first place. That will carry you into the basics of Shii-Cho, and the Shii-Cho Stance talent. SHII-CHO STANCE- Gain +1 to Melee Defense per Rank of Shii-Cho Stance if engaged with two or more opponents, or against one foe wielding two or more melee weapons. 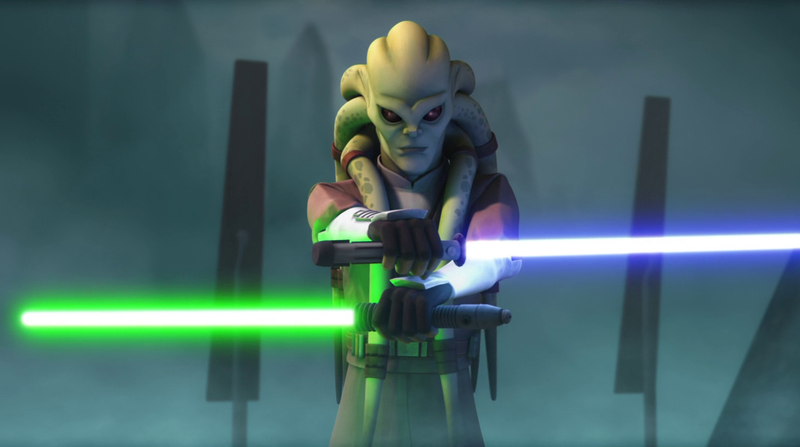 Form I is supposedly great at dealing with multiple opponents, and it is specifically called out that the reason Kit Fisto handled himself well against General Grievous's Quad-Lightsaber Attacks in the "Lair of Grievous" episode of the Clone Wars cartoon (the same episode that featured the only appearance of Commander Fil) was because he was a Form I master. Shii-Cho is also about removing your opponent's ability to fight, so the tree includes two talents that either disarm or sunder the weapon from your opponent's hands; Sun Djem and Disarming Slash. Finally, Form I Mastery is at the highest tier in the tree and gives the duelist the opportunity to strike multiple foes around him. FORM I MASTER- Spend a Destiny point when engaged by multiple opponents to take a Form I Master action. Make a Lightsaber attack against the opponent with the highest difficulty to hit. If successful, apply damage to that opponent as normal, then apply half damage to one additional opponent for each 2 Advantages spent. No target may take damage more than once during this attack. The GM has final say on which engaged opponent is the highest difficulty to hit. I might change the damage to be equal to the duelist's ranks in Lightsaber, or simply to a base of 5 (which should cut down most minions). Niman is all about using the Force while dueling with a Lightsaber. To that end, Niman and Form VI Mastery allow the character to either use the Move power against the same target of a successful lightsaber attack, or make a free lightsaber attack against a target you pull to engaged-range with you with Move. There's a lot of references in the Expanded Universe to Jar'Kai having many connections to the basic moves of Niman. This is why I've placed it so you have to go through the basics of Niman to get to Jar'Kai. Jar'Kai will give your character a base Defense of 2, allow you to make a strike that adds both lightsaber damage together as one hit, and allow you to give a single lightsaber attack the Autofire quality once an encounter with Jar'Kai Mastery. A lot of these talents were influenced by, or taken directly from the Form trees made by GM Jedi-Scoundrel on the D20 Radio forums. He's doing some good work over there, and while his trees don't fit my style, his talents certainly have merit. A lot of the forthcoming trees and talents have work that was either inspired by him, or outright yoinked from his trees (with his permission of course.) Big thanks to him and "good job" with his work. This is all a teaser of what I'm working on for these trees. The full trees may make appearances soon, before next Thursday. Keep an eye out, keep checking back, or keep following me here, on Facebook, or on Google+ to be notified of when they post up. I'm going to be the Guest Host on the Order 66 Podcast this weekend. Tune in live Saturday night and hear the hilarity ensue. Or download the podcast next week and listen at our leisure. I'll also be at the Higgins Armory Museum on Saturday. Every year they have a "Star Wars Day" and it's a big hit. With the Armory officially closing at the end of the year, this is our last year to troop it. If you're in the area, come on out and say "Hi!" I'm working on some writing for a project with Fiddleback. I'm also doing some writing and home-brew design for a few "Lightsaber Combat Talent Trees" for Edge of the Empire. I'm going to need them if I'm converting over my Order 65 game to Edge. That might involve me blatantly borrowing from some good work being done by GM Jedi-Scoundrel over on the D20 Forums. I'm interviewing the folks from the UK Rebel Legion Base (Elstree Base) for the next All Wings Report In podcast. And finally, it's finally nice out so the wife and I are getting some much needed yardwork done. So lots to do in the next few days, and I'm strapped for time. Tune in next week as I try to finally get up a post on something completely unrelated to anything I mentioned in this post. No matter the era, guard duty is dull. In a fit of frustration this week, I posted a comment on my Facebook wall saying "If I don't run a game soon, I'm going to __________." There were some cute comments, some dumb ones, and some folks who just seemed to agree with my comment. As I march towards the end of my fourth decade of existence, I find myself gaming less and less. My wife doesn't game, so I need to balance time with her with hours spent gaming. Many of my players still LARP, which means that for the Spring and Fall entire months go by where we can't find time to play (seriously, I tried to schedule a game for one of my groups and the soonest we could come up with was July). I do a lot of work with the 501st and Rebel Legions, so that eats up afternoons on the weekend. I live in New Hampshire now, and most of my players live within the Route 495-128 belts of Massachusetts. This situation almost entirely eliminates the possibility of running a weeknight game. ﻿It's no secret that people are now only a Skype call or a G+ Hangout away. Gamers have known a few ways to keep folks at the gaming table, thanks to a few Virtual Tabletop programs out there. Since 2007 I've been using the powers of the internet to continue gaming with one of my long-time buddies, Alex. Originally using a web-camera pointed at the game board to track movement, our ability to game with him increased ten-fold with the discovery of Maptools. the idea of how it looks. Maptools is a solid virtual tabletop program, free to use, with a ton of features if you happen to know a couple computer languages. It's Java-based, and is community driven and supported, which of itself are two hurdles. Movement can be locked to a grid, or free form. You can apply fogs of was, and reveal it in sections based on a PC-Token's sight lines. If you're not doing anything crazy, or using some obscure game system, the community has probably made a framework for use with the system you're playing in that has all these neat macro buttons like "Damage Taken", "Healing Received", "Status Applied" and the like. You can input your whole character and the macros will account for damage reduction, and see if wounds are applied. The map-making feature in Maptools is really where I find this program most helpful. Like Photoshop, you have layers that you can put different objects on, even a GM-Only layer that won't display on any PC screen. With the art tools that are out there, I can whip up a pretty decent map in very little time at all. The biggest problem with Maptools is it's a really finicky program to get up and running. It's Java-based, and hosted on their side on servers. They have really odd interaction issues with router and computer firewalls, and while the community has made some helpful guides to troubleshooting why Alex in Georgia can't log into the server, it's not always clear to those of us who didn't take many CS courses in college 15 years ago. Also, if you want to use a new system and have the lack of CS background, you're not going to be able to just pop in a framework and get all the neat macros for your damage tracking needs. I like Maptools, but lately Java updates have been messing with the system. Java 7+ won't let Maptools run at all on some computers, and we're constantly having to roll back to Java 6+ just to play. But it's been the only game in town for me any my players; at least, until recently. Enter Roll20; the web-based online virtual tabletop for role-players of all sorts! Different than Maptools, Roll20 uses a web based interface, meaning anyone on any device that can open a web browser can theoretically connect to the tabletop. I'm not sure I'd ever want to look in on a smartphone, but still. Roll20 is free-ware, to a point. They have a subscription service, monthly fees of $5 or $10 will get you more features (like POV lighting and some scripting like Maptools-style Macros) as well as more online storage space for your maps, tokens, and art. The interface is very clean, I like the functionality of the token interface, and can assign several notations to several tokens. Little blue dots could mean flying, orange for immobilized, and a big red "X" for dead (or just "down"). I can easily have several pages of maps ready to go, and easily click between them. D&D Adventurers slaughter a Behir and her kids. You even have an option for playing sounds and songs through the program via their jukebox. Big problem though is copyrighted material. If you want to use your own music (like, say, anything from the Star Wars Soundtracks) you have to upload them to a SoundCloud account. Their Terms of Service prohibits the broadcast of any copyrighted material over the internet. So if I did want to use "Heroes of Destiny" or "Duel of Fates" as background audio for a fight, I could get my SoundCloud account banned. Personally, I think there's a better product out there for what I want to use, be it Syrinscape or another web-based sound system. There are a few key detractors to Roll20. First, there's practically zero map-making ability in the program. I need to at least make a background in some other program like Photoshop or Dundjini, save the map, upload to Roll20, and then I can drop in objects to populate the rooms and scene. The other issue is the limitations of my art library. I have over 15 gigs of art on my computer for map making. The most you can have access to online through Roll20 is 2, and that's if you subscribe at the Mentor level ($10/month). I can't have all my artwork at my fingertips, so if the PCs do something unexpected and I need an art asset as an object, vehicle, or token, I need to open my library, have it search through my folders, upload to their system, and then I can drop it on the map. And by doing that, I've reduced my available storage with Roll20 by the size of that art item. Remember that everything takes up this space; background maps (which are usually 2-12 megs on their own), objects, vehicles, tokens; everything reduces your available storage space. I have made a discovery that a bunch of my art objects appear to be available as free-use in Roll20s own storage center, so it doesn't eat up my storage as much if I utilize those. I think if I'm going to be running any sort of weeknight game, it's going to have to be remotely and will likey use Roll20 in the future. Maptools, while brilliant and awesome to have had for the past few years, pales to the simple user interface of Roll20. It's too bad I didn't get in on Roll20's kickstarter, else I'd have some neat bells and whistles for my account. Ah well, I'll cope. I haven't purchased a subscription yet, because I haven't needed the extra stuff yet. Once I do start running games, I'll probably at least do the $5/month level. Not sure I need the benefits of the $10 level. But we'll see. Anything that can get me gaming more often is a good thing. Time to swing the blog back to gaming; specifically the realm of home-brewed rules. No secret I'm a big fan of the Jedi, and with the rulebook for them in the Fantasy Flight system 2 years away, there's a growing community of folks out there making their own house-rules for handling Jedi. It kind of makes me wonder if this was FFG's plan all along. I doubt it, but I could see them incorporating or at least being inspired by some of the rules and options folks out on the internets are making. It's probably not how freelance works, but that's neither here nor there. In my world, such leaps of logic are possible, but reality's mileage may vary. Here are a few alternate rules for Edge of the Empire. These will likely be superseded in a couple years when Force and Destiny comes out, but until then feel free to yoink these for your games. This is one of those powers that's had a bit of talk, and a few folks over on the D20 Forums have taken a stab at it. They're making it work in the FFG system by making it a Talent, or a full-blown Force Power with it's own advancement tree. I sort of have a problem with this power being a Talent or a Force Power. I've always had an issue with it, especially in the various Wizards of the Coast versions of Star Wars Role-playing. My biggest beef is it's ability to be a crutch, and a cheap way to keep tabs on your enemies. Want to see what's inside the fortress you are supposed to break into? Use Farseeing. Curious what evil plot your campaign nemesis is working on? Use Farseeing. Can't find your car keys? Use Farseeing. It's also annoying from a GM standpoint for a player to try and use Farseeing and the GM just doesn't have anything ready. If I've spent hours writing up a plot line, and had zero time to think about characters not involved with the session, I won't have anything ready when the player drops a good d20 roll and states he's looking in on the nemesis of the party (who isn't involved in the current adventure) and see what he's up to. Maybe I wasn't ready for that, and I blurt out something I regret later. sometimes the story that comes off the top of my head is not what's best for the campaign. It's not like I feel right preventing it's use, too. The player has invested points and character choices into that ability, but sometimes the I just can't come up with the scene the player sees, or I don't want to. Farseeing should be a Force power that's used at the speed of plot. That's how it's portrayed in the movies and cartoons. Visions in the force are a plot mechanic that can reveal clues or secrets within the campaign story. I like the idea of it being linked into the Sense power. So here's the rule I'm running with. The Force-User may attempt to view subjects or places far away from their present location. The character can take a Farseeing action. The character rolls their Force Rating and must score at least one Light Side Point to activate Farseeing. The gamemaster determines if a vision is revealed to your character. If no vision is revealed, the Gamemaster states something to the effect that the Force is cloudy and no scene was viewed. 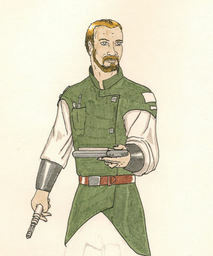 If the Gamemaster allows a vision to be seen, a Light Side Destiny Point is flipped to Dark, and the scene is described to the character. The accuracy and detail of a successful Farseeing use is based on the number of Light Side Points rolled on the Force dice. More points means the visions give better detail and understanding, or may even hint at events in the future or past. These visions are rarely in exacting detail, and most often manifest as impressions or brief snippets of life or scenes. The gamemaster can even give the character a vision of something else entirely from what the Player was trying to view with Farseeing. 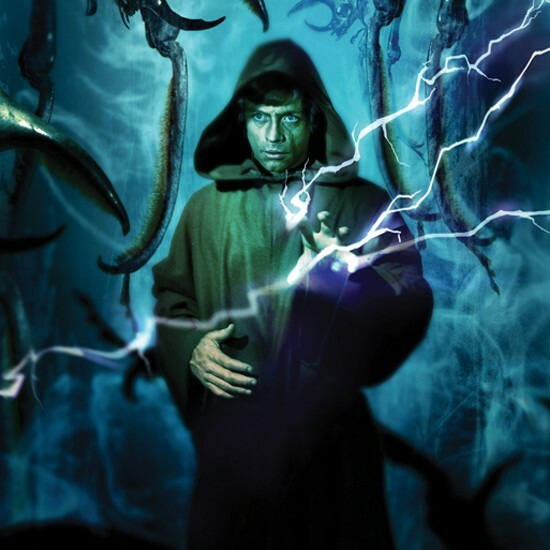 Additionally, the Gamemaster may ask the player any time their character is resting or meditating to make a Farseeing check, as sometimes disturbances in the Force reveal visions to those who are sensitive. If you've purchase Sense up to any of those upgrades, your character has invested a bit into the Sense tree and has an increased proficiency with sensing changes within the Force. They should reasonably be able to perform a Farseeing check. But, the success of the Farseeing check is ultimately up to the Gamemaster. By making the power a sort of "bonus ability" to learning more powers in Sense, a Gamemaster doesn't necessarily need to feel obliged to use the Farseeing result any time a Player tries to use it, but it's there for a GM to use and even abuse when the character is resting. There are situations where two Force Users are going to want to help one another with a task. Maybe three Jedi are trying to lift a large boulder, or a Master and Apprentice are attempting to Influence a large crowd. The current Rules As Written don't have anything to handle what happens when such characters try to help each other, but we can extrapolate from what happens when a group of characters tries to perform a task together. For normal skill checks, you take the character with the highest attribute for the task and match it with the character with the most skill ranks for the task. For Force Use, the two factors are "who rolls the most Light Side points" and "who has the highest level of proficiency in this particular power". When a group of Force Users are attempting a task using the Force, the group chooses who is going to be the primary Force User. Each Force User rolls their Force Rating, and the primary Force User can use the best individual result to power his Force Power's results. All Force Users must have the Talent or the basic level of the Power they are attempting to use in unity. So let's say a Jedi has spent points on the Move tree and unlocked all the upgrades, but only has a Force Rating of two. Maybe he wants to pick up large (Silhouette 2) boulder that's at Medium Range. Possible, but he has to roll at least 3 Light Side Points on the Force Dice. 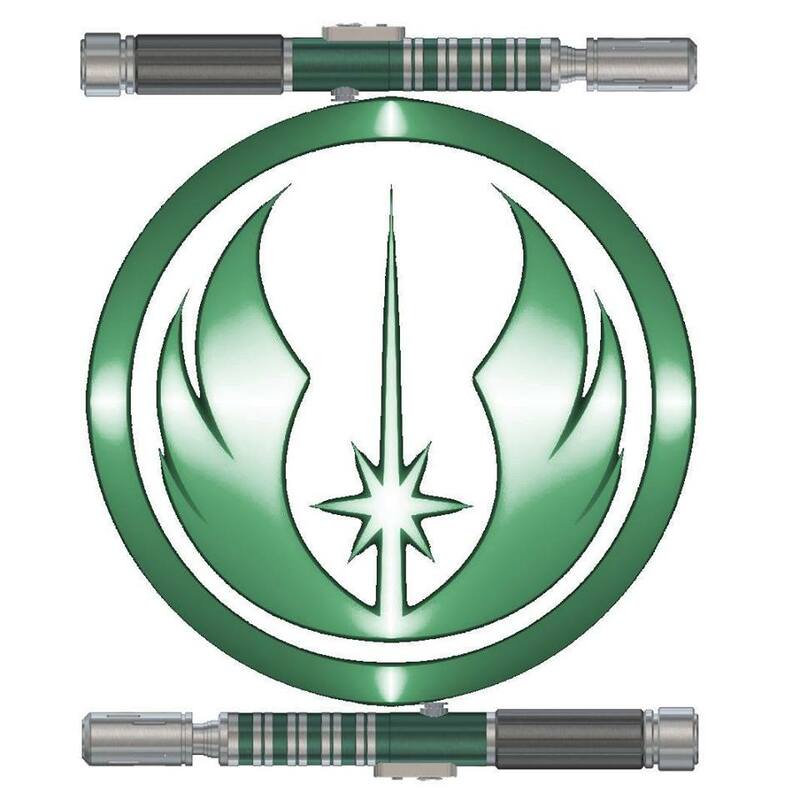 If another Jedi comes along who has a Force Rating of 2, but doesn't have any points in Move aside from the first, basic power level, the two Jedi can roll together. 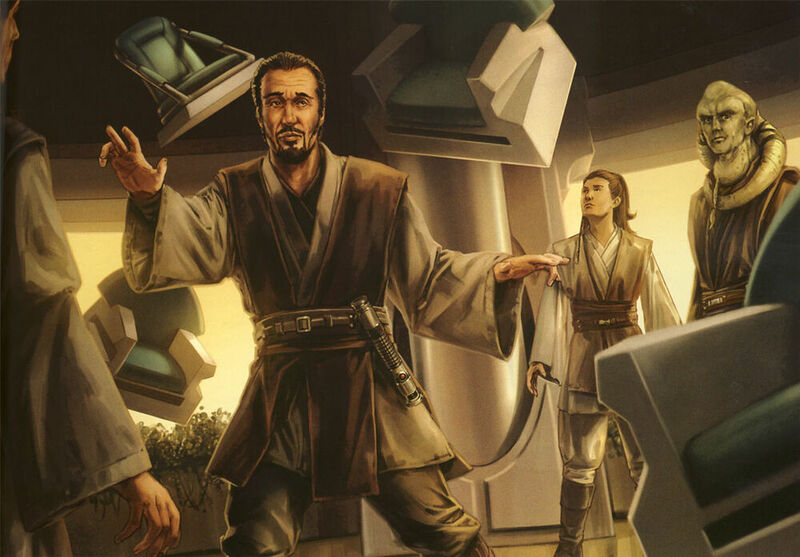 If the one skilled in Move is named the primary, and the other Jedi happens to roll 3 Light Side Points when the Primary only rolls one, the Primary can use the second Jedi's result to power his use of Move. Surge, Force Run, Force Speed, Force Leap; what ever you call it, it's the Force power that lets you move really fast, and jump really far. There are canon uses all over the place; Jedi leaping great distances, and moving really fast. The problem is game balance. How can you have someone doing their impression of Quicksilver or The Flash and have it be balanced? To be fair, Edge of the Empire is a lot less tactically-based than the three previous incarnations of Star Wars Role Playing Games. It's a key ability, but it's a very difficult power to replicate. It covers distance travelled while running, distance while jumping (which has been quite significant), surviving falls from great heights, and even vertical movement by walking on walls for a short amount of time. Some crafty players out there have made this a Talent that adds successes to Athletics checks, or redesigned it into a Force Power tree that allows Force-Users to buy into upgrades for the various effects. I think this works best. Jon Stevens on the D20 Radio forums has some good suggestions for what a tree would look like. Just some "off the top of my head" ideas/ramblings, but perhaps keep the base power as simply providing an extra Maneuver that can only be used to move, up to a max of 3 Maneuvers per round? Power itself being activated I'd keep as an Action. Control Upgrades could be "spend 1 LS point to ignore difficult terrain when using this power" with a further upgrade being "spend 1 LS point to treat impassable terrain as difficult terrain when using this power*" Add a Control Upgrade that "reduces falling damage by one degree per LS point rolled." Maybe two or three Magnitude Upgrades to provide an additional maneuver's worth of movement. However, having this as a power does bring in the concern of players abusing this by constantly using it, something that doesn't really jive with how we tend to see this sort of thing done in the movies and the EU, as you'd have to introduce an artificial limit to how frequently this could used, either in a scene or in a session. Mind you, such a limit isn't something I have a problem with, but not everyone agrees with that sentiment. I think this is a good place to start. I'm going to work on my own "Force Speed" Force Power tree and see what I can come up with. I'll post it up here and share it with the Gamer Nation at large. Heck, with another development, I might even get to playtest it a bit. Next week, we stick with Star Wars RPGs and a pretty beefy project. I'm converting over my Order 65 game to Edge of the Empire. It's been quite a task, figuring out what talents and skill ranks look right for the characters, and determining what a good base point is for total XP.